إذا كنت تبحث عن فندق بموقع جيد في طريق المحيط العظيم - خليج أبولو، فقد وجدت ضالتك في Chris's Beacon Point Villas . إن موقع الفندق الاستراتيجي، الذي يبعد 8 km فقط عن مركز المدينة، يسمح للنزلاء بالوصول سريعاً وبسهولة إلى العديد من الوجهات المحلية المثيرة. يشكل هذا الفندق ملاذاَ مريحاً للاسترخاء ويمنح زواره فرصة للاستجمام والتجدد، وهو يقع على بعد خطوات من المعالم السياحية الكثيرة للمدينة كمثل: Marriner's Lookout. استمتع بالخدمات الراقية والضيافة التي لا مثيل لها بهذا الفندق في طريق المحيط العظيم - خليج أبولو. يقدم الفندق فرصة للاستمتاع بشريحة واسعة من الخدمات بما فيها: مرافق مخصصة لذوي الاحتياجات الخاصة, واي فاي في المناطق العامة, صف السيارات, خدمة الغرف, غرفة عائلية . في Chris's Beacon Point Villas غرف نوم يزيد عددها عن 9 صممت بذوق وعناية لتوفر لك كل وسائل الراحة . بعضها يحتوي أضاً على تلفزيون بشاشة مسطحة, غرف لغير المدخنين, مكيف هواء, تدفئة, مكتب. كما أن مجموعة الخدمات الواسعة الموجودة في الفندق لضمان راحتك تترك لك الكثير من الخيارات لقضاء وقتك أثناء فترة إقامتك. يحظى فندق Chris's Beacon Point Villas بموقع ممتاز وخدمات يصعب منافستها. a few minute drive to the beach but triple the time to the town. it was a great hotel to stay in to if u wanna relax and be away from the busy city. it was great. location wise r not very good but if u wan a quite hotel, u need to go to the small town right? Nice room with perfect view. Surprised that there were lots of wild parrots outside the window. Friendly staffs. Great views , comfortable and welcoming villa. Peaceful location with excellent outlook over the bushland and sea. Friendly staff and restaurant ambience welcoming and warm. Staff friendly and warm and the quality of the food and presentation excellent. Would recommend and at a reasonable tariff. We stayed here based on a friend's strong recommendation, which raised our expectations pretty much. Breakfast and dinner were excellent, albeit a little pricey. Views from the room and restaurant were partially blocked by trees which have grown a little big, but still pretty awesome. Road to the villa were well marked out by signs, not too difficult to find the place. 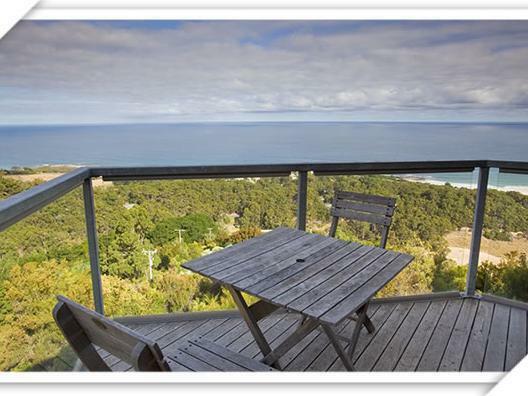 This property is a great location for taking day trips along and around the Great Ocean Road. The view is beautiful from the mountainside villas. Our 2 bedroom villa with living room and kitchen were perfect for our family. Breakfast included was sufficient, and other options were available if needed. We had heard the dinner was great in the restaurant, but we never got a chance to eat there. I don't think our kids would have found anything they really liked, besides we were out sightseeing until late in the evening during our stay and didn't make it back in time to eat at the property. We called in for a one night stay on our trip along the Great Ocean Road. The excellent customer service started the minute we laked into reception and did not falter for the whole stay. The food in the restaurant was absololutely mouth watering and delicious. I thoroughly recommend calling into either the restaurant or staying the night - you will be rewarded for yuor effort. great scenic view with a lovely glass dining restaurant overlooking the sea and the nature surrounding it. The villa is also lovely with great spacious rooms and comfy beds. The stay was awesome. Great view. Big rooms and comfy beds. However toilet do smell a little but that's just a small issue. The heater do take some time to heat it up but overall, the villa is just perfect for lovely couples who wish to explore the area and have a great dinner at Chris restaurant. The food was fantastic especially the eye fillet. Impressive! Restaurant's excellent food, service and views through floor-to-ceiling windows. 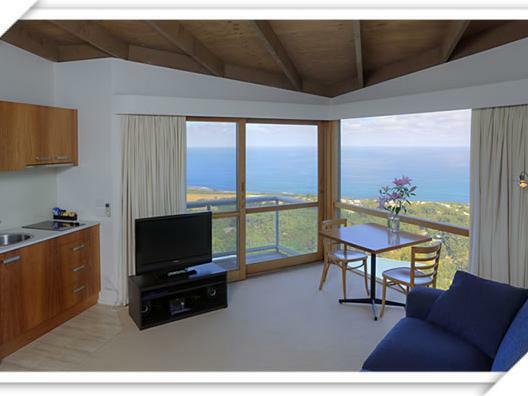 Two main views are from high on a hill: the Ocean (4 km away and 5-10 km up & down coast; sheep farm below. Our visit was in the middle of winter- last week of July 2014. See 3 best things, above. Room was clean although sliding door window screens had cobwebs in corners. Definitely good value for $$ spent. If you do not stay on site, definitely eat at the restaurant- Such gastronomic quality along the Ocean Road is rare. We arrived at 6.30pm which already dark at the winter night. Upon arrival, check-in was easy and the room was prep well even with heater and electric blanket turned on. Table was reserved at the restaurant area even though we ended up cooking our own dinner. We ordered room services for the dessert which was superb!! Probably the only thing that needs improving was the sign to turn into the villa. we drove through mountain road but no visible sign towards that direction at night so we missed the turn in. View, View and the View. The stay was amazing. We had been travelling up the great ocean road and it was such a nice place to stop at. The internet photos are exactly what it was like.... We thoroughly enjoyed it. The restaurant was nice to dine it but a little expensive. Good if you wanted to have a few wines and not have to worry about driving. Iverall I would recommend to stay here. overall was a pleasant stay, except for occasional appearance of spider and worms on rainy days. but should not be an issue if your windows are shut. though there was a blackout in the middle of the night, the power resumed at around 3am in the morning. We were a couple meeting up with some old friends for part of our holiday and so booked a 2 bed villa for 3 nights as we wanted somewhere of very good quality with a lounge area that we could spend time in with them catching up. The villa had an exceptional view and lovely lounge/kitchen area. The only negative would be that the 2nd bedroom was a bit small with no real room for luggage but I think most people probably use this 2nd bedroom for a child which would be absolutely fine. The continental breakfast was absolutely superb and we ate in Chris' restaurant on one of the evenings and that was first class and extremely popular. We rented the flat they have for our family. , it was perfect. The couple who managed the Motel was so nice and dedicated, doing everything to make our stay pleasant. The Motel is 5 mnn from the center and the beach where we spent two afternoons and where the boys swam. this was my second stay at beacon point villas - well worth a return trip. 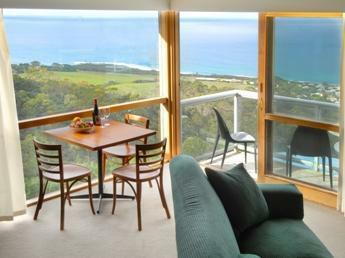 the views from the two king studios (i have now stayed in them both) is spectacular; the villas are high on a hill over the village of skene's creek - about a ten minute drive from the lovely seaside town of apollo bay. the bush and the sea are both just beyond the balcony: native birds fly onto the balcony of an afternoon, and far below, you can see the surfers trying their luck in the waves. breakfast (which is included) is great - wonderful croissants; lunch and dinner is available. try the baked ocean trout - which is sensational, along with the chocolate torte. very friendly service. it's a bit expensive - but it's really worthwhile. 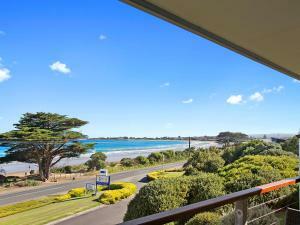 Accommodation is located high in the hills overlooking Skene's Creek - about 5 kilometres from Apollo Bay. Fantastic views from the room with wall to ceiling windows and a balcony. 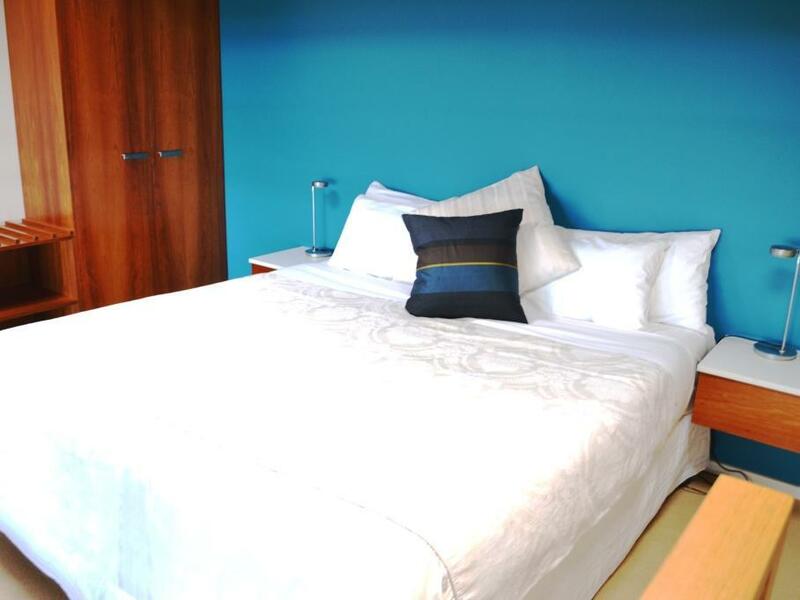 Comfortable bed in a large space, with kitchenette - including microwave, crockery, etc. Very large bathroom with enormous shower. Stayed in this good family owned hotel for two nights. The room is not too big, but very clean, and view is very nice. The food in the restaurant is very good, but a bit expensive as well. The wind was very strong during my stays so it is a bit noisy. By the way, the location is not easy to find, would suggest to place a sign beside the road.